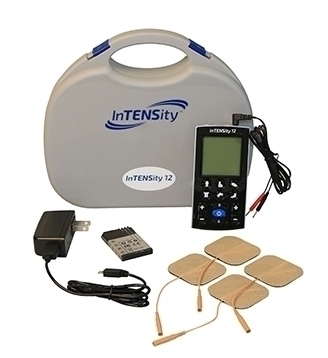 The InTENSity" 10 Digital TENS electrotherapy device allows patients to select from ten pre-set body icons for targeted therapy. Comes complete with AC adaptor for effective therapy on the go. 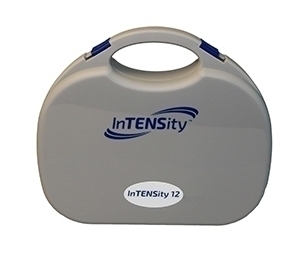 Simple to operate, portable electrotherapy device for pain management. 2-button operation. Device has ten pre-set body part selections making it easy for patients to target certain areas in pain. Body part selections include: neck, shoulder, mid back, low back, elbow, wrist, hip, knee, ankle and foot. Individual body part selections have a customized treatment program based on researched protocols. Comes complete with carrying case, two sets of lead wires, 9-volt battery, AC adaptor, manual and pack of four self-adhesive reusable electrodes. Power Source: Standard 9-volt battery or AC adaptor.